Imagine a time-line diagram as an analog for the history of our planet, it’s about a kilometer long and the last two centimeters, painted red, represents the impact of humankind. On this scale of things, a group of materials we commonly refer to as plastics would fail to register. Plastics, the most ubiquitous of modern substances has only been present for the last 130 years, in this sliver of time, production has gone from zero to 5000 million tonnes per year. In English, the word plastic is derived from a Greek language-root plastikos, meaning to mould or having the power to give form to; and certainly in our contemporary environment plastics give form to an astonishing range of materials, objects and potentials. Think of the stunning insulating properties of expanded polystyrene; remember the inactive, therefore completely resistant molecular properties of PTFE (fluoroplastics), and don’t forget the rare bio-active material - a composite of polypropylene - which can be grafted onto and absorbed by our bodies immune system. Even this page is laminated with a copolymer! 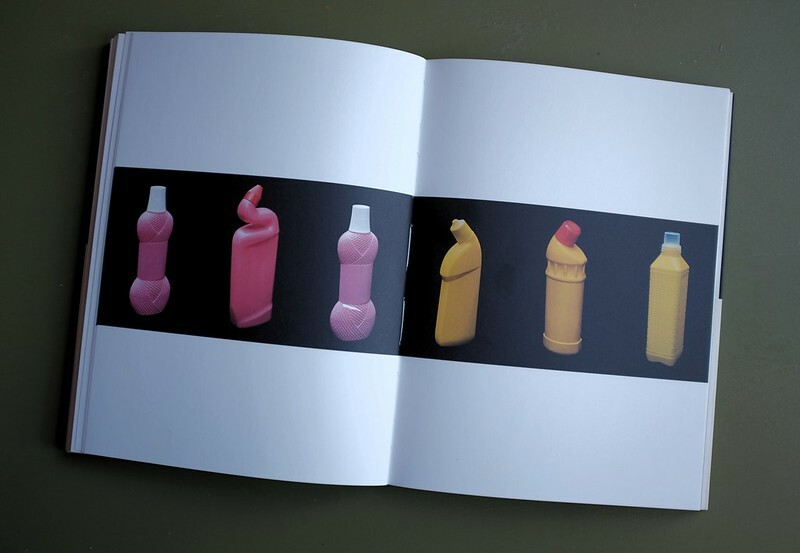 One can only gasp at the proliferation of objects and properties subsumed under the generic term, plastics, their collective trajectory through culture represents an astonishingly viral expansion. At present, structured by some fifty distinct family groups, each manifesting hundreds of different property variations, mutating into thousands of composites, currently restrained and protected by some five thousand trade names. As with most things, it is difficult to be precise about the origins of what we might recognize as modern plastics. Various gums from tropical trees, especially rubber and gutta percha (latex) were mass manufactured in 1847 to protect and insulate trans-Atlantic submarine telegraph cables. But it was probably an Englishman, Alexander Parkes who first introduced a semi-synthetic material – essentially cellulose fibers modified with nitric acid- at the Great International Exhibition of 1862. Parkesine was perfect for the manufacture of small household bibelot – the pens, clocks, boxes, card holders, broaches, pipe stems, coasters, knitting needles, handles and buckles beloved by the Victorian bourgeois in their desire to stuff their homes with things. Unfortunately Parkesine proved continuously unreliable; celluloid is highly inflammable! Plastics truly came of age with the arrival of a group of materials known as phenolics, essentially sticky resins bulked with various fillers and poured into moulds. Phenolics have become characterized through the material Bakelite, developed in Britain by Belgian born Leo Baekeland and James Swinbourne in the 1920s. Although Bakelite had been patented some years earlier, it was the meeting of a thermosetting material and assembly line production techniques which unleashed the endless production of things, Continuous process machines were pioneered in the cotton mills of Manchester, England in the 1880s but manufacturing techniques were optimized at the Ford Motor Company plant, in River Rouge on the edge of Detroit in 1913. The assembly line fused with a scientific management of labour -Taylorism, to rationally increase productivity through extreme concentration on very simple tasks. Moulded plastic objects were perfect for mass-production and phenolic goods poured from factories into the domestic, post-First World War consumer market. The polymorphous nature of Bakelite was extended by its ability to absorb the potential of additives, like wood, flour, textiles and mica. An astonishing array of artifacts were able to emerge almost complete from the die-press mould. They required little in the way of finishing –grinding, sanding, painting or polishing for instance, merely the removal of the flash line, the extruded excess from the casting process itself. Phenolics because of their somber colours –essentially black and dark brown- high heat resistance and low electrical conductivity became synonymous with the emerging domestic electronic market for telephones, clocks, radios, gramophones, toasters and eventually televisions. The search for different materials and manufacturing technologies -particularly the pursuit of brilliant colors and ceramic like finishes through the use of urea and melamine resins- produced a range of signature household items even during the depression and war of the 1930s - 1940s. Streamlined, sleek and circular, the monocoque form of the Ekco AD65 wireless receiver, designed by Englishman Wells Coates in 1935 is often identified by design historians as an aesthetic break point. The radio, ceases to imitate the previous wooden box `cabinet` construction of powered domestic objects, and beautifully exploits the fluid and sensuous relationship between mould and cast. Plastics are lodged in our consumer consciousness as completely synthetic, when in fact the materials are derived –as with everything else in our material culture- from ‘natural’ sources, principally oil, natural gas, coal and salt. The origin of this confusion, and the reason we can identify a radical shift in the history of technology is the depth of our technological intervention. As the material Bakelite and its derivatives multiplied, a German organic chemist Hermann Staudinger evolved a theory about the chemical characteristics of a group of both natural and synthetic substances we now refer to as polymers. Staudinger`s theory not only described the specific nature of plastics -a long, durable chemical bond between a series of identical basic units, a polymer chain- but it also prescribed ways in which they could be reliably manufactured. This is the first time in our evolution that we are able to organize, and subsequently design the molecular structure of a given material; we are about to make rather than merely process a material in the very same instant as we manufactured the object. From the late 1930’s we enter the era of the ‘Poly’ plastics. Giant Industrial chemical corporations that had gained experience from the manufacture of previous materials began to research, find and patent a range of thermoplastics destined to enter the language by becoming household names. The versatile Nylon 6 was launched by the American company Du Pont in 1936, soon followed by the almost friction-free, non-stick Teflon, and the five times stronger than steel Kevlar; the British Imperial Chemical Industries (ICI) produced the waxy and inert polyethylene, followed by the bright and transparent polymethyl methacrylate, known as acrylic, or more commonly by one of its trade names Perspex. A stream of new polymers whose names we can barely pronounce let alone remember have gone on to become some of the most intimate materials in our environment; PTFE, polycarbonate, PET, polypropylene, polyurethane, ABS and acetal, and these are complemented by a constantly mutating range of silicones, epoxy and polyester resins. It quickly became apparent to manufacturers and designers –and the Wells Coates Ecko AD65 is a fine example of this- that the same internal electric components could easily be sheathed in a variety of phenolic derma. This possibility of selling essentially the same function –lets say a wireless receiver- to differing market segments, simply by offering a variety of casings over a standard chassis, accelerated the range of ‘models’ available. By changing the casing designs, manufacturers could also market the same internal components as a ‘new’ object, which in turn facilitated the acceleration of products, their promotion and consumption. And as the attention of both manufacturers and consumers shifted to the thin plastic skin of domestic things, the influence of advertising and promotion increased; objects could be easily linked to passing fashions or seasonal changes. A slowly assembled set of cultural values, values learnt through our manufacture, use and exchange of objects over generations; a tradition of materiality and value based on depth, weight and density is about to be replaced by one of surface, speed and promotion. By the late 1950s fifteen of the major plastics had been developed, and were in constant production. Advances in the designed properties of plastics introduced new manufacturing possibilities. Melted polymer powder could be poured into moulds, or through extrusion moulding, forced through a shaped nozzle to produce tubes and pipes. Materials could be squeezed into a mould under pressure through injection, blow, rotational or compression moulding, rolled out as a sheet through calendaring, or laminating, or inflated with gasses into a micro-thin films. Manufacturing spewed domestic objects into the vast black hole of the post-world-war consumer boom. The phenolics, the dense and dark souvenirs of the previous war years gave way to the infra-thin, light, primary colored, and strange smelling group of materials derived from polyethylene. The various and often contradictory revolutions of the late 50`s and 60`s, whether sexual, ideological or financial, found their equivalent in material culture; they are literally mirrored in plastic. Polyethylene has become the material icon of the period; a sign of all the abundance and optimism, and yet at the same time an index of all that is cheap and transient. In the first flourish of a truly mass audience for objects and images something insubstantial was at its heart. The French semiologist Roland Barthes, when writing a short essay Plastic in the late 1950`s, perceptively located the essence of the material 'it is less a thing than the trace of a movement'. Barthes describes visiting a Trade Exhibition; on display was a large oblong metallic machine, sparkling green crystals are fed into a hopper at one end, and at the other, the finished object -let’s imagine a washing up bowl- emerges. Between these two extremes is nothing, nothing but transit. For Barthes the restless semiologist, it would seem that plastic is the perfect modern material, a medium that can be endlessly transformed into more and more extraordinary objects. But although semiological play amuses Barthes on the level of theory, he derides plastic on account of its `substance`, or to be precise, its lack of it. It’s a disgraced material, lost between the effusiveness of rubber and the flat hardness of metal. Barthes, while seduced by the possibilities inherent in perpetual sign exchange, makes the mistake of trying to fit the possibilities of plastics into a traditional material economy. And this traditional material economy is founded on slowly assembled relationships between the preparation of materials, their specific properties, visible construction techniques, the finished artifact, and its potential uses. Imagine an intricately assembled, carved, polished and upholstered piece of furniture, a chair for instance. Remember the sourcing of the diverse material – the wood, fabric, steel, cotton wadding, glue and varnish. Their preparation –seasoning, machining, turning and transportation, and the harvesting, spinning, weaving and dying. Their assembly – the jointing, gluing and upholstering, the chairs distribution, its retail display, promotion and eventual purchase. Through these slowly accumulated syntactic rules of our material world we have evolved economies of value, where the various investments – of skill or craft, of money or time, of history or narrative- are all recoverable in the material biography of the object itself, and find their equivalence as the financial price we are prepared to pay. We can mostly recognize an old chair and tell if it has been lovingly, beautifully, carelessly or crudely made, and negotiate a price accordingly. Although plastics have a frightening lack of substance, and no discernable evidence of manufacture they are intense materials. Behind the crisp transparency of the latest micro-thin PET mineral water bottle, is an extreme concentration of designed performances, and a high density of information. But in a strange paradox, the very disappearance of presence in plastic things -lighter, smaller, thinner, and sparkling in their transparency, has triggered an exponential growth in their promotion and advertising. Things are always already designed and reproduced on our behalf, by someone else, and we generally encounter them through our promotional culture of retail. A network of forces -design, reproduction and retail distribution- through which we are coerced into thinking of ourselves, not as articulate users or makers of things, but as consumers of cultural products. Adrift amongst the promotional themes in consumption, objects and people become relays for the rapid refreshment of capital; we buy, use and dispose of things, no longer able to gauge the quality of those exchanges. Of course, it’s not even the insubstantial plastic objects that we want, but their lush coating of images and aspiration that mesh with, and are propelled by, a wider culture of advertising and broadcast medial. By encouraging us to invest so heavily in things, capital distributes the feeling of participating in a dense social web of competing aspiration, characterized by an endless and unbroken cycle of desire, acquisition and disillusionment. Encouraged by advertising to extend ourselves through every object, image, smell and service the contemporary subject of consumption is performed through an array of goods, rather than acting as the disinterested ringmaster. Of course disillusionment follows exchange, its never the object which is used up, what burns is the mutual relationship between us, and the object of our advertising desire. Waste management, the care of things we no longer desire or want, looms ever larger in our contemporary consciousness. The reuse and end use of objects becomes an ever more pressing issue, and in theory all unwanted plastic objects can be collected, sorted, dismantled, cleaned, recycled or incinerated safely. Its just that until recently there has been little ethical, environmental or economic incentive to make this viable. A life cycle analysis of an object, is an attempt to define all the obvious, and imagine all the hidden costs of production; essentially it’s an inventory of all the materials, energy, emissions and wastes involved in the biography of things. Compared to other more traditional objects and processes –remember the upholstered chair, plastics require a relatively small amount of energy in the transmutation of matter into objects, and back again. After its primary use, where the material as object makes its first pass through the commodity loop of product, use and waste, plastics are capable of being sorted into separate family streams for reprocessing. Essentially to be washed, ground, melted and reformed. Although generally unsuitable for their original use, these plastics can be transform ed into other potentials; for example, PVC sheeting becomes ‘expanded’ insulated cladding, PET bottles transform into fabric fibers for ‘fleeces’, and disposable polystyrene cups can assume the form of video cassette cases. For plastics unsuited to such chameleon like behavior, they can be added to dilute other ‘primary’ streams, mutate into composites, or eventually incineration becomes the best and only option. But even here manufacturers profit from the ‘recovery’ of some of the energy expended in the production of the original material as object. Plastics have a high calorific value, and the energy released through incineration produces steam, which can be used to turn turbines, produce electricity and then sold to a local energy provider. Incineration is also being augmented by trials in ‘chemical cracking’; this is where the strings of polymer chains making up the plastic material are broken into smaller sequences, they are then capable of being recombined as the building blocks for new materials, or deployed as additives. Growing the markets in recyclates will allow manufacturers to close the circle on the introduction of raw materials, their subsequent transformations through people as products, and the eventual ‘recovery’ of unwanted material through recycling for the process to begin again. Plastics have turned objects into a medium. Seen in the perspective of life cycle analysis, the portion of energy unrecoverable by the plastics industries is potentially very, very small. And even more importantly the potential for profit is efficiently extracted and multiplied. The forces at work within contemporary capital are beautifully encapsulated by the history and trajectory of plastics. Blinded by a culture of promotion, our absurd investment in things obscures the condition of our own reproduction; we have become a revenue stream for capital. The text is related to The Value of Things, A Joy Forever and #TransActing.